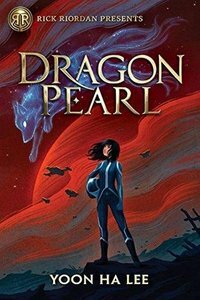 The most recent book from Rick Riordan Presents, Dragon Pearl, by Yoon Ha Lee (January 2019), takes Korean mythology on a wild ride into space, and it's lots of fun! Actually I take that back, it isn't really "fun" because mostly things are going wrong for the young heroine, Min, a shapeshifting fox girl from a backwater planet. The book starts by things going very wrong indeed, with a government agent coming to Min's family farm to ask about her older brother, a cadet in the space corps. who apparently deserted to go find the legendary Dragon Pearl, a device of terraforming magic, Min ends up knocking him out with a sauce pan. Recognizing that staying peacefully at home isn't a great option for her, Min decides to set out on her own to find her brother. Finding the Dragon Pearl would be great too--her planet's terraforming never was completed. Her journey eventually takes her to the very war ship her brother served on. A newly dead cadet lets her assume his form (something fox magic lets her do), and she, a thirteen-year old girl, has to use all her magic and cunning to pass as a 16 year old boy. And now she has the ghost's agenda (solving the mystery behind his death) to take care of as well as her own quest for her brother and the Dragon Pearl. So there are lots and lots of times when everything is very tense indeed, making it hard for me to relax. Happily, there are less fraught elements as well, such as Min's experiences as a cadet, trying desperately to figure out what she's supposed to be doing, and making friends with the friends of the dead boy (which is a little disturbing, but which is all sorted out in the end). The friends are a female dragon and a non-binary goblin with a snack-conjuring fork among other magics, and I loved the parts of the story in which they and Min are together. The plot is intricate without being confusing, the world-building is superb, and the characters are well-developed, and Min, in particular, with her mix of cunning and naivete, is fascinating. Min's magic, and the magic of other supernatural types of persons encountered along the way, add wonder to the sci fi elements. I now wonder why there aren't more hybrid sci fi/fantasy space stories, because when well done, as it is here, it's great reading! I've really been looking forward to this one - Yoon Ha Lee's adult sci-fi novels are fabulous. I haven't read any of her adult ones, but now I want to!